BBQ ribs might not spring to mind as a company-worthy dish, but trust us. Topped with tangy caramelized onions, it's a dish your guests will remember. Line roasting pan with foil. Place ribs in prepared pan; brush both sides of ribs with dressing. Bake 20 min. Reduce oven to 300ºF. 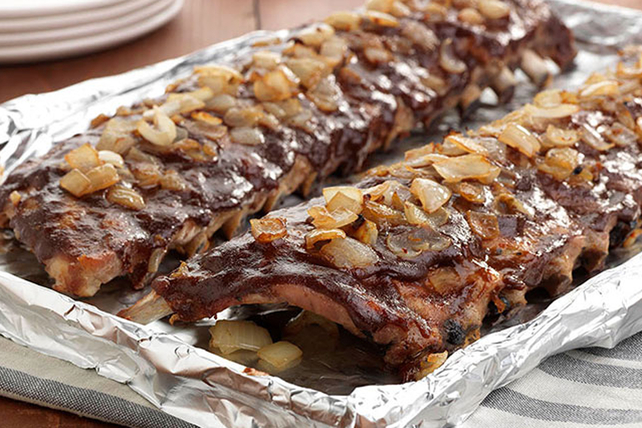 Top ribs with onions; cover with additional foil. Bake 2 hours or until ribs are tender. Transfer ribs to cutting board, reserving sauce in pan. Pour reserved sauce through strainer; discard strained liquid. Reserve strained onions for later use. Return ribs to foil-lined pan. Increase oven to 450ºF. Mix barbecue sauce and mustard until blended; spoon over ribs. Top with reserved onions. Bake, uncovered, 25 min. Serve with mashed potatoes and your favourite hot cooked green vegetable.